Warm caramel bananas simple to make with only six ingredients it is ready in no time. Since I have started writing this blog I keep my eyes open for new and delicious recipes. If I can find recipes that are simple and fast it makes it all the better. When you work as many hours as I do there isn’t always a lot of time for baking and cooking during the week. So when I found the recipe Warm Caramel Bananas in a (Kraft food & family Deliciously Simple. Everyday magazine) I thought it was just what I was looking for, simple, delicious, and fast. Now, this recipe is not something I would have considered making before I started writing this blog; so I was stepping out of my cooking comfort zone. This is one of the reasons that I have enjoyed writing a blog; it has taken me to new levels of baking and cooking. I have enjoyed making new things that I would not have tried in the past. The recipe is simple to make and does not have a lot of ingredients, but I believe it is one of those comfort foods that everybody would enjoy. 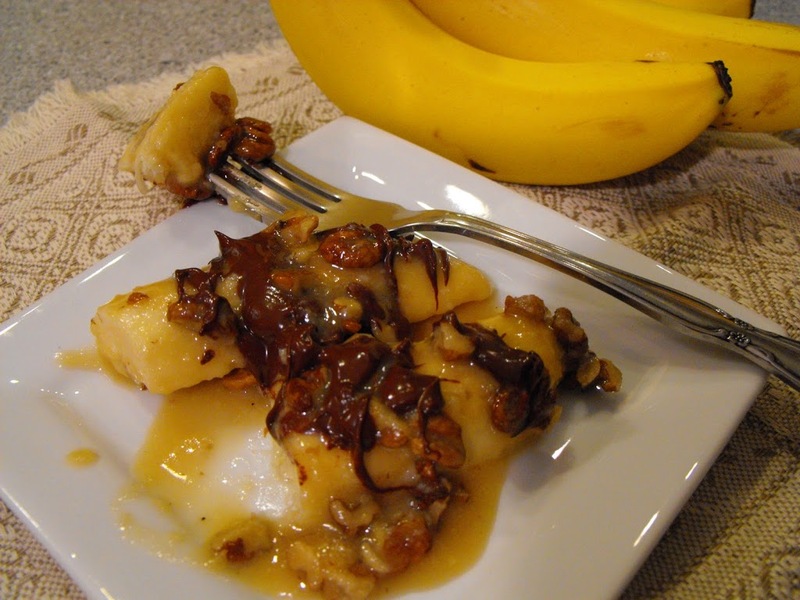 The caramel is light and not too heavy and tastes amazing with the bananas. The nuts add a little crunch that is very pleasing to the dessert. And the chocolate I think tops off everything, really doesn’t chocolate make almost everything taste better. Melt butter in large skillet on medium heat. Add sugar; cook until melted, stirring occasionally. Reduce heat to low. Gradually add sour cream; cook 1 minute. Cut bananas in half lengthwise and crosswise creating 4 half slices each. Add banana slices cut sides down, and pecans to skillet. Cook 1 minute or until bananas are evenly coated and tender, basting occasionally with sauce. 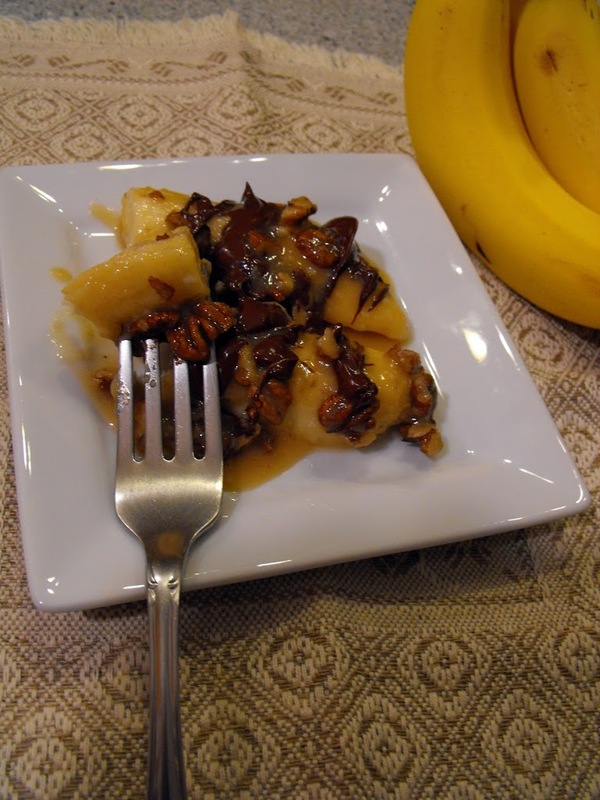 Spoon bananas into 4 dessert dishes; top with remaining sauce from skillet. Drizzle chocolate on top of bananas. Melt chocolate chips in the microwave. I melted them slowly in the microwave 30 seconds at a time, stirring them after each 30 seconds so that they will not overcook. I altered this recipe in a couple of ways. The recipe called for peanuts which I did not have so I substituted pecans and it called for a square of Baker’s chocolate which I did not have so I substituted that with the chocolate chips. I’ve never had caramelized bananas. They look heavenly! It looks delicious. 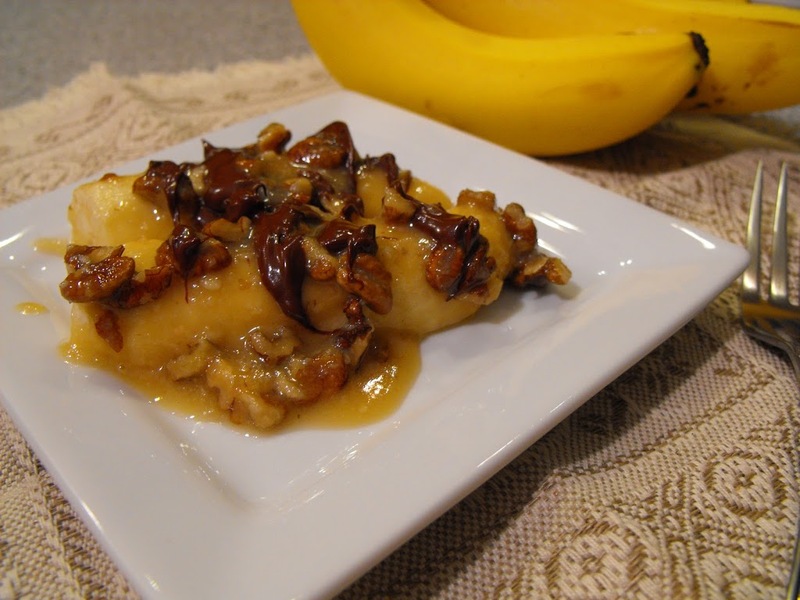 My hubby loves bananas so I will be making this. YUM!!! So glad to find your blog!